A quick report from Siggraph, now I’m finally over the jet lag. Much to our surprise we went straight into a press interview on arrival at the conference and conducted a fair few more over the following days with assorted Internet and paper based press. 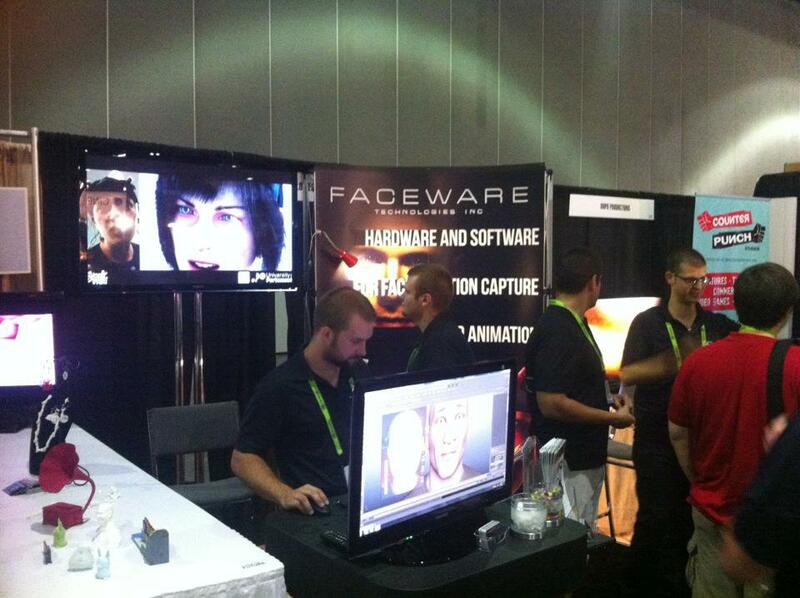 All thanks to our gracious hosts FACEWARE, who’s booth we spent a large proportion of the conference at. We were very excited to see our test shot playing on their booth on arrival (pics below) , particularly as we hadn’t planned to attend Sigraph until next year. We spent a few hours each day wandering around the show seeing what tasty software morsels we could add to to our ever growing shopping list. It was great seeing what’s out there at the moment and chatting to people about new methods and software that could benefit our ambitious pipeline. And we came away with quite a shopping list of new toys for the production. Having a project such as ours in full swing helped a lot, as we were able to engage on a production level and go straight to the nuts and bolts of production problems and requirements, rather than simply being a university asking for freebies. Alex managed to secure quite a few potential new sponsors, proving himself time and time again to be a honed conference panther. We were lucky enough to attend some fantastic after show events and got to see Digital Domain’s capture stage, where we witnessed the new Vicon software in operation with real time performance capture and what appeared to be a rock-solid real-time skeleton solve, (convincingly illustrated by a writhing pile of mo-cap zombies). I was also pleased to find out that our patented Egghead TM technology for visualising facial performance on pre-viz mocap puppets is almost identical to the process Digital Domain use. Although I thought ours had a better name. We also got to attend some useful talks. Of particular note was Pixar’s pipeline talk on Brave, which gave us some great ideas for our pipeline and was the only illustration of a complete creative film pipeline on show at Siggraph. 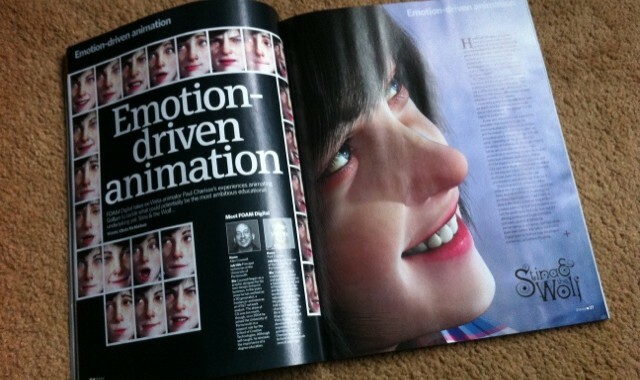 It encompassed the whole film making proses, from concept and ADR through to final render/composite; particularly useful, as our organisation has a lot more in common with Pixar than most other VFX houses; as we are effectively producing our own in-house script/storyboard/concept art/costume design/performances/direction/sound design/music etc. It highlighted some specific design areas we need to address on our production, particularly in the areas of costume design and cinematography. 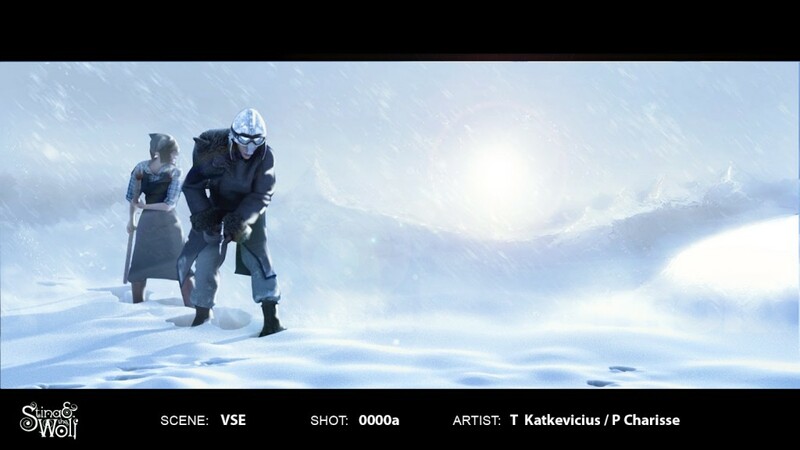 It also illustrated some interesting ways their concept team feeds back and forward with the VFX team. It was a very fluid work flow, that kept the dialogue going well past the initial concept phase and allowed the artists to negotiate creative elements that responded to the constraints and problems of high end CG production. They also had a miracle solution for making large amounts of controllable foliage called “Wondermoss”. A solution that everyone, including us, was clearly in awe of. Unfortunately it transpired that it can only be made if you have a crew member that can think in binary 24/7 and views the world as a network of intertwined mathematical algorithms; Never mind then. For the rest of the show Alex and I attended as many after show events as we could. Some were quite an eyeopener, as we dived into the world of the LA party networking scene, where the hunt for the next rung on the career ladder is always on and it’s best not to mention your humble origins, lest the attendant gaze drift to tastier prey on the next table. As a result we decided a more suitable title for LA would be the “City of Angles”, as most of these party angels seemed to have an agenda. Maybe we were just too British. Either way we both agreed that it definitely wasn’t for us. Jet lag aside, we came back with quite a glow, as we’d received a fair few complements about the student work and a lot more press coverage than we’d ever imagined. The FACEWARE guys made our experience at the show most enjoyable, as did VICON and SHOTGUN, who were both very accommodating and we’ll hopefully see them all next year with an even better batch of work. So roll on next year’s show, but with maybe slightly less evenings out and more cups of tea in our hotel. It’s been a few months since our last report and we’ve been very busy dealing with the myriad of complexities involved in feature length animation production. The departments have been hard at work making assets for the film with Alex and I problem solving the increasingly complex and demanding pipeline. We have both been effectively doing about 6 jobs each to cover all the bases from motion capture integration to general rigging and TDing, shader and render integration, plus mastering all the various software and techniques required to bring our CG world and characters into existence and pass this on to the teams. The seemingly never ending developments in CG mean that we seem to be learning completely new methods to integrate into our pipeline every week. The benefit of this has been that lots of what we only dreamed was possible is now quite feasible: things like layered cloth systems made from proper tailored patterns, dynamic muscle, hair and skin systems for the characters, clouds that react properly to light and environments and even systems that do geologically based 3d simulations of rock strata for our mountain ranges. It’s slow going, there’s no doubt about that, but the amount being learned by us and the students is phenomenal and a reward in itself, if a little exhausting at times. We are hoping things will settle down once we have the pipeline working smoothly, as most of the pain at present comes from getting the assets to move between departments in a coherent and elegant manner. We have finally seen our first motion capture sessions coming to life on the CG rigs and will hopefully have some great stuff to put up on youtube in the coming months. The deadline we imposed on ourselves for the trailer has been, unsurprisingly extended (the joy of being your own client) This has mainly come as result of all of the above. The reason we set out to limit ourselves to the trailer was to find, then iron out these bottle necks before we tackled the full feature, so it’s all going to plan, more or less 🙂 The imbalance in the department numbers has been occasionally problematic, as Alex and i have had to step in and help out more than i was expecting and this is something we’ll be looking to address in our next recruitment drive. We now have our project management software Shotgun in full swing and it’s amazing to see a complete industry production environment with all the shots, tasks and dependencies active and being used by the students. We also now have our NAS drive (big computer where we store everything) hooked up to the university system and the internet, so we should be able to let the team work, review edit and publish remotely in the very near future. We have a pick-up shoot coming up at Easter, where we’ll be capturing a few extra scenes with Becky and also our dance director Natalie Curds, who will be impersonating a variety of exotic gypsies. I’m personally looking forward to putting the director’s hat back on, if only briefly and prizing off the rather cumbersome digital-fix-it hat. Shotgun Software Inc. – Film Industry online asset management, scheduling review and tracking software; as used by many VFX and film production companies. They have agreed to lets us partner with them, allowing us to use their software for the duration of the project. We will be testing and feeding back to them as we integrate it into our pipeline. VICON – World leaders in Motion Capture hardware and software, provided the free loan of 8 of the latest motion capture cameras (worth £120,000) for the duration of our shoot in August. The hire cost of these cameras would have been in excess of £30,000. Vicon have also offered free software training and technical support during the project lifecycle. The Foundry – Providing free software licenses and development support for compositing and project management. They are working with us to develop a new software tool for managing the assets in a CG film pipeline. Solid Angle – We are on the beta development program for a piece of rendering software called ARNOLD, an as yet unavailable commercial product, but used exclusively by Sony DreamWorks in their latest feature: GREENLANTERN. They have also offered us educational licenses for the project at a reduced cost. We are currently in negotiations as to final costing. cabling, audio mixing equipment, facial mask making equipment and production consumables. Rabbitskin Ltd. – A multimedia production company who provided the loan of 4 facial capture systems worth £2000 for the shoot. On the finance side of things we are still in negotiation with Faculty about a yearly budget. Talks are currently focused around ironing out the legal issues surrounding student Intellectual property rights as regards the film content. As the project now has a proven track record in providing industry related experience and software skills (that are being utilised on quite a few different degree courses), we are confident the money will be forthcoming soon. Hopefully more news on this next month.